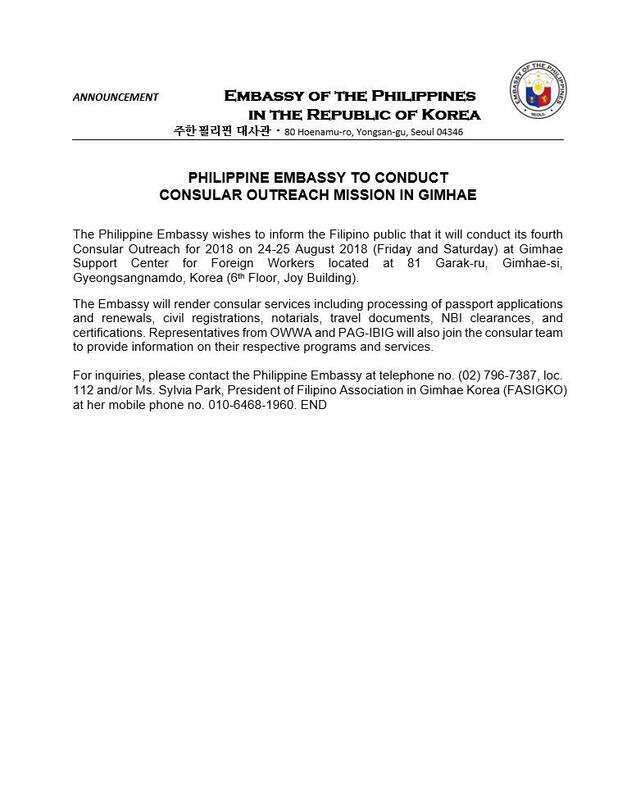 The Philippine Embassy wishes to inform the Filipino public that it will conduct its fourth Consular Outreach for 2018 on 24-25 August 2018 (Friday and Saturday) at Gimhae Support Center for Foreign Workers located at 81 Garak-ru, Gimhae-si, Gyeongsangnamdo, Korea (6th Floor, Joy Building). The Embassy will render consular services including processing of passport applications and renewals, civil registrations, notarials, travel documents, NBI clearances, and certifications. Representatives from OWWA and PAG-IBIG will also join the consular team to provide information on their respective programs and services. For inquiries, please contact the Philippine Embassy at telephone no. (02) 796-7387, loc. 112 and/or Ms. Sylvia Park, President of Filipino Association in Gimhae Korea (FASIGKO) at her mobile phone no. 010-6468-1960.